I am the webmaster for Bill Wall's Chess Page. I'm responsible for the maintenance of the website, to include formatting and posting of new articles, links, resources, PGN collections, and so on. I also maintain our Twitter feed. I learned to play chess in the early 1980s. I was largely self-taught but I did take lessons for about six months from a local master. 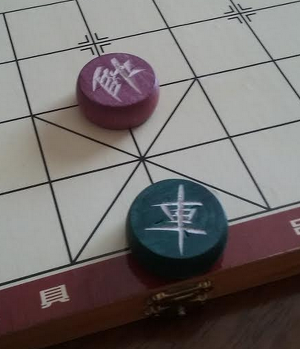 I continued to play chess through high school but took a break from chess to play Xianqi (Chinese chess, or Co Tuong in Vietnamese) in high school. I reached about 1800 in Xianqi and was one of the extremely few non-Asian players at the time (I never met another non-Asian player back in those days). I was regularly winning at coffeehouses in the Little Saigon area in California, where people couldn't believe a non-Asian kid could play Co Tuong well. I was taught the game by Vietnamese people, and one little-known difference between Vietnamese and Chinese play — at least back then — is that in Vietnam checking "from behind" the opponent's General (King) with a Chariot (Rook) is considered a breach of etiquette and usually not allowed. The following is probably my best game ever. I won against Bill Wall back in 1994. I managed to grind this out and win after 80 moves. This is the sort of thing you have to do. No game is a foregone conclusion because a mere book or computer program says so. Any opponent no matter how good can always make mistakes. If you want to be good like Bobby Fischer you have to fight like Bobby Fischer. If you look at some of the tournaments today, these GMs like Carlsen, Karjakin, Caruana, and so on are drawing game after game... just like the Soviet GMs did in the 1960s. The Soviets tried — and failed — to break Fischer by drawing among themselves, whereas a lot of players today just want a break. Magnus Carlsen once said, "the day chess stops being fun is the day I give it up." Bobby Fischer would never have said such a thing. For Fischer, chess was life and life was chess. But this, and his invincible will to win, is why Fischer was the best ever (except perhaps for Paul Morphy...). In my spare time I enjoy chess (of course), Magic: The Gathering, updating this website, and spending time with my family. I've largely given up on Xianqi because of the lack of opponents in my area, as I enjoy the game in person much more than online. I talk to Bill Wall often, probably once a week or two. I am always looking for more information to post on our chess website, or new novice chess players who need help improving their game. I have my own website where I write on religion, morality, politics, and other subjects. I can be reached by sending an email to tpkatsa2 at gmail dot com.